This is a compilation of the OOP Sun Creature EP (released by Man's Ruin, RIP), the Nebula/Lowrider split, plus three new tracks. Although recorded three years apart, the formula remains pretty much the same - fuzzed out monster riffs, pounding rhythmic section, all topped off by Eddie Glasses' perfect rock n' roll rough vocals. For the already initiated, the three new ones are all pretty swank, especially "Rocket", the rip-roaring opener. I actually liked all three better than anything I heard on the last full length. The tracks from the split LP with Lowrider were produced by grungemeister Jack Endino, and are among the heaviest, most fuzzed out songs these guys have ever laid down. Especially awesome is the "Fall of Icarus", which pulls out every cliché in the hard rock manual (feedback intro, fuzz bass, backwards guitar outro) on top of an absolutely colossal guitar riff. 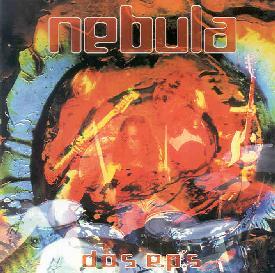 Probably my favorite song from Nebula to date, a stoner rock classic. The material from Sun Creature is also great (the title track is a close second to "Icarus"). If you don't know 'em, this is a great place to start. Folks who grew up on early seventies hard rock (think Blue Cheer, Zep) or mid 80's pre-commercial grunge such as Mudhoney, and who still occasionally pull those old records to play air guitar to will love this. Dos EPs is distributed by Meteor City. You can visit their web sit at: http://www.meteorcity.com/.